Young Carla's mom discovers grandpa's beautiful old guitar tucked away in a closet while cleaning. 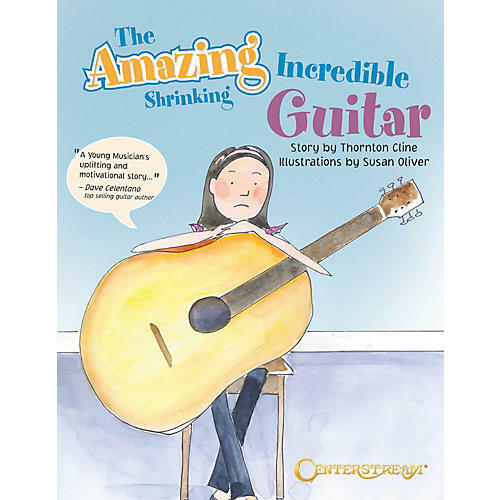 Carla falls in love with it and wants to play, but her mom and dad tell her the guitar is way too big for her - she'll need to grow before she can play. Carla struggles to play the guitar anyway. Her hand, arms and fingers hurt from stretching. Her friend tries to help her: still the guitar is too big until one night she is visited by the guitar wizard who changes everythign. Carla is amazed at what happens next. She learns the power of persistence and detmination - to never give up. The book includes ten original easy singable songs with whimsical illustrations by acclaimed illustrator Susan Oliver. Recommended for ages 4-8.